When the haze lifts from the grass at daybreak and the heavy heat punches out the afternoon, even air conditioning doesn’t entice me toward a plate of steaming supper. In high summer I’ll always choose something room temperature. I want it simple and light, with a tart edge. 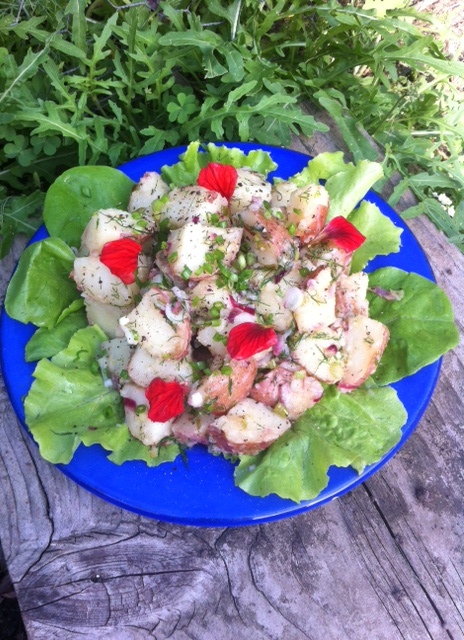 There’s seldom a dish more tempting than a good potato salad, and for my choice, the French style is the way to go. Here’s the essence of a creamy potato with the zest of good wine vinegar, gentle green onion, fresh herbs and extra virgin olive oil. It’s best freshly prepared, cooled to room temperature. It can wait several hours but should never go in the refrigerator. Something happens to a potato when it goes in the fridge. A raw potato will take on unlikely sweetness if stored in the fridge and a cooked potato becomes stodgy. This salad is ideal for picnics even in hot weather since it can be made ahead and there’s nothing in it that can spoil during the day. Lift yourself away from the heavy deli yellow potato salad and try this method for a fresh take, better flavor, better for you. Place potatoes snugly in a heavy pot. Just cover with cold water; sprinkle with salt; top with lid and boil until tender when pierced with toothpick. Pour off water and return pot to low heat for 5 minutes to steam. Meanwhile crush garlic with salt using the back of a spoon in a bowl or use a small mortar. Add vinegar, wine or water and mustard. As soon as the potatoes can be handled (they should still be quite warm), cut potatoes in quarters or eighths and place in shallow bowl. Sprinkle with vinegar mixture and chopped green onions. Fold over to mix using a rubber spatula. Cover with tea towel and cool to room temp. Add olive oil and chopped fresh herbs; gently fold again using rubber spatula and turn into serving dish. Garnish with lettuce, nasturtium leaves or diced fresh tomato. Serve immediately for 2–4 or hold at room temperature for a few hours. Flavor will be drastically altered if refrigerated. When I grew up I wanted to be like Bonnie Garmen. The mother of a friend of mine, Bonnie brought hot cocoa when we skated on Connected Lakes in winter and drove us to Green Mountain Falls in summer. She wore pressed khaki Capris, gold clip-on earrings, and her kitchen sink was turquoise—always elegant and gracious. Bonnie welcomed me into her kitchen like a pal even though I was just a teenager. She made me lunches of tomato aspic or crab toasts, and we shared recipes on her porch. I still have several of her name-topped recipe cards in my file, and the ingredients spill out in my schoolgirl’s scrawl. 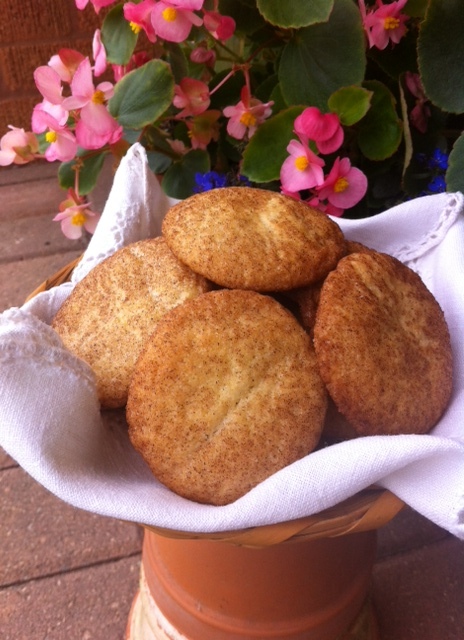 When a July day arrived that was not too hot to switch on the oven and I thought about a picnic cookie good with ice cream, I scrambled through my old file box to find Bonnie’s Snickerdoodles. The original recipe calls for shortening which I now replace with butter, and since I’m sensitive to the aftertaste of chemical leavenings I have reduced both the cream of tartar and the soda. To turn the cookie into something crisp and flat, perfect for little ice cream sandwiches, use the alternative leavenings of baking powder and less soda. Make half the recipe on the first go to see if it’s comfortable, and allow time for the dough to chill before shaping. Like snicklefritz, snickerdoodle may be a nonsense word of German origin, but this cookie’s been around for generations making it sensible enough. *use 2 teaspoons baking powder plus ¼ teaspoon soda for alternative leavening. Cream softened butter and sugar. Beat in eggs and vanilla. Sift over flour, cream of tartar, soda (or baking powder and soda) and salt. Mix well to combine into soft dough. Scrape dough onto sheet of plastic wrap, fold edges to cover, flatten and chill at least an hour. Preheat oven to 375º. Roll chilled dough into balls cherry-size for small cookies or walnut-size for larger cookies. Shake rolled balls in bowl of mixed cinnamon and sugar to coat completely. Place on cookie sheets lined with parchment or Silpat mats. Bake 10–12 minutes or until lightly browned around edges and still soft in center. Makes 6–8 dozen cookies. You are currently browsing the Mary Jo's Kitchen blog archives for July, 2013.